STEALTH AIRCRAFT PRINCIPLES AND PROPERTIES - WHAT MAKES STEALTH TECHNOLOGY WORK? WHAT MAKES STEALTH TECHNOLOGY WORK? Stealth technology also known as LOT (Low Observability Technology) is a sub-discipline of military electronic countermeasures which covers a range of techniques used with aircraft, ships and missiles, in order to make them less visible (ideally invisible) to radar, infrared and other detection methods. The concept of stealth is not new: being able to operate without the knowledge of the enemy has always been a goal of military technology and techniques. However, as the potency of detection and interception technologies (radar, IRST, surface-to-air missiles etc.) has increased, so too has the extent to which the design and operation of military vehicles have been affected in response. A 'stealth' vehicle will generally have been designed from the outset to have reduced or controlled signature. It is possible to have varying degrees of stealth. The exact level and nature of stealth embodied in a particular design is determined by the prediction of likely threat capabilities and the balance of other considerations, including the raw unit cost of the system. A mission system employing stealth may well become detected at some point within a given mission, such as when the target is destroyed, but correct use of stealth systems should seek to minimize the possibility of detection. Attacking with surprise gives the attacker more time to perform its mission and exit before the defending force can counter-attack. If a surface-to-air missile battery defending a target observes a bomb falling and surmises that there must be a stealth aircraft in the vicinity, for example, it is still unable to respond if it cannot get a lock on the aircraft in order to feed guidance information to its missiles. Almost since the invention of radar, various techniques have been tried to minimize detection. Rapid development of radar during WWII led to equally rapid development of numerous counter radar measures during the period; a notable example of this was the use of chaff. The term 'Stealth' in reference to reduced radar signature aircraft became popular during the late eighties when the F-117 stealth fighter became widely known. The first large scale (and public) use of the F-117 was during the Gulf War in 1991. However, F-117A stealth fighters were used for the first time in combat during Operation Just Cause, the United States invasion of Panama in 1989. Since then it has become less effective due to developments in the algorithms used to process the data received by radars, such as Bayesian particle filter methods. Increased awareness of stealth vehicles and the technologies behind them is prompting the development of techniques for detecting stealth vehicles, such as passive radar arrays and low-frequency radars. Many countries nevertheless continue to develop low-RCS vehicles because low RCS still offers advantages in detection range reduction as well as increasing the effectiveness of decoys against radar-seeking threats. The possibility of designing aircraft in such a manner as to reduce their radar cross-section was recognized in the late 1930s, when the first radar tracking systems were employed, and it has been known since at least the 1960s that aircraft shape makes a very significant difference in how well an aircraft can be detected by a radar. The Avro Vulcan, a British bomber of the 1960s, had a remarkably small appearance on radar despite its large size, and occasionally disappeared from radar screens entirely. It is now known that it had a fortuitously stealthy shape apart from the vertical element of the tail. On the other hand, the Tupolev 95 Russian long range bomber (NATO reporting name 'Bear') appeared especially well on radar. It is now known that propellers and jet turbine blades produce a bright radar image; the Bear had four pairs of large (5.6 meter diameter) contra-rotating propellers. Another important factor is the internal construction. Behind the skin of some aircraft are structures known as re-entrant triangles. Radar waves penetrating the skin of the aircraft get trapped in these structures, bouncing off the internal faces and losing energy. This approach was first used on SR-71. The most efficient way to reflect radar waves back to the transmitting radar is with orthogonal metal plates, forming a corner reflector consisting of either a dihedral (two plates) or a trihedral (three orthogonal plates). This configuration occurs in the tail of a conventional aircraft, where the vertical and horizontal components of the tail are set at right angles. Stealth aircraft such as the F-117 use a different arrangement, tilting the tail surfaces to reduce corner reflections formed between them. 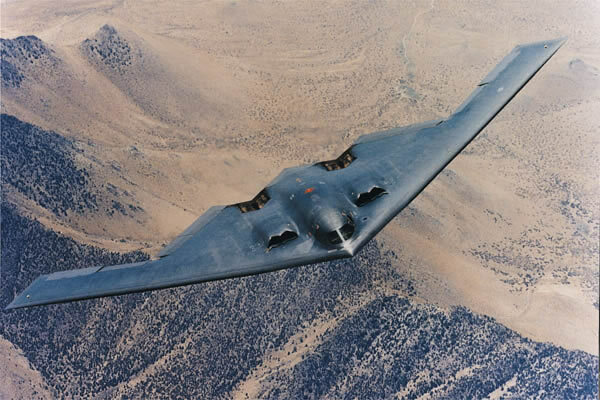 The most radical approach is to eliminate the tail completely, as in the B-2 Spirit. In addition to altering the tail, stealth design must bury the engines within the wing or fuselage, or in some cases where stealth is applied to an existing aircraft, install baffles in the air intakes, so that the turbine blades are not visible to radar. A stealthy shape must be devoid of complex bumps or protrusions of any kind; meaning that weapons, fuel tanks, and other stores must not be carried externally. Any stealthy vehicle becomes un-stealthy when a door or hatch is opened. Planform alignment is also often used in stealth designs. Planform alignment involves using a small number of surface orientations in the shape of the structure. 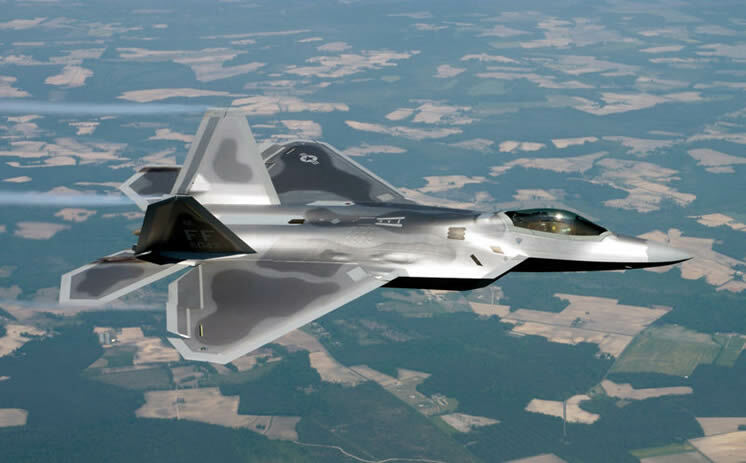 For example, on the F-22A Raptor, the leading edges of the wing and the tail surfaces are set at the same angle. Careful inspection shows that many small structures, such as the air intake bypass doors and the air refueling aperture, also use the same angles. The effect of planform alignment is to return a radar signal in a very specific direction away from the radar emitter rather than returning a diffuse signal detectable at many angles. Stealth airframes sometimes display distinctive serrations on some exposed edges, such as the engine ports. The YF-23 has such serrations on the exhaust ports. This is another example in the use of re-entrant triangles and planform alignment, this time on the external airframe. Shaping requirements have strong negative influence on the aircraft's aerodynamic properties. The F-117 has poor aerodynamics, is inherently unstable, and cannot be flown without computer assistance. Some modern anti-stealth radars target the trail of turbulent air behind it instead, much like civilian wind shear detecting radars do. Ships have also adopted similar techniques. The Visby corvette was the first stealth ship to enter service, though the earlier Arleigh Burke class destroyer incorporated some signature-reduction features . Other examples are the French La Fayette class frigate, the USS San Antonio amphibious transport dock, and most modern warship designs. Now in research, fluidic nozzles for thrust vectoring with aircraft jet engines, and ships, will have lower RCS, due to being less complex, mechanically simpler, with no moving parts or surfaces, and less massive (up to 50% less). They will likely be used in many unmanned aircraft, and 6th generation fighter aircraft. Fluidic nozzles divert thrust via fluid effects. Tests show that air forced into a jet engine exhaust stream can deflect thrust up to 15 degrees. Dielectric composites are relatively transparent to radar, whereas electrically conductive materials such as metals and carbon fibers reflect electromagnetic energy incident on the material's surface. Composites used may contain ferrites to optimize the dielectric and magnetic properties of the material for its application. Radar absorbent material (RAM), often as paints, are used especially on the edges of metal surfaces. One such coating, also called iron ball paint, contains tiny spheres coated with carbonyl iron ferrite. Radar waves induce alternating magnetic field in this material, which leads to conversion of their energy into heat. Early versions of F-117A planes were covered with neoprene-like tiles with ferrite grains embedded in the polymer matrix, current models have RAM paint applied directly. The paint must be applied by robots because of problems of solvent toxicity and tight tolerances on layer thickness. Similarly, coating the cockpit canopy with a thin film transparent conductor (vapor-deposited gold or indium tin oxide) helps to reduce the aircraft's radar profile because radar waves would normally enter the cockpit, bounce off something random (the inside of the cockpit has a complex shape), and possibly return to the radar, but the conductive coating creates a controlled shape that deflects the incoming radar waves away from the radar. The coating is thin enough that it has no adverse effect on the pilot's vision. Shaping does not offer stealth advantages against low-frequency radar. If the radar wavelength is roughly twice the size of the target, a half-wave resonance effect can still generate a significant return. However, low-frequency radar is limited by lack of available frequencies which are heavily used by other systems, lack of accuracy given the long wavelength, and by the radar's size, making it difficult to transport. A long-wave radar may detect a target and roughly locate it, but not identify it, and the location information lacks sufficient weapon targeting accuracy. Noise poses another problem, but that can be efficiently addressed using modern computer technology; Chinese "Nantsin" radar and many older Soviet-made long-range radars were modified this way. It has been said that "there's nothing invisible in the radar frequency range below 2 GHz". Much of the stealth comes from reflecting the transmissions in a different direction other than a direct return. Therefore detection can be better achieved if the sources are spaced from the receivers, known as bistatic radar , and proposals exist to use reflections from sources such as civilian radio transmitters, including cellular telephone radio towers. Acoustic stealth plays a primary role in submarine stealth as well as for ground vehicles. Submarines have extensive usage of rubber mountings to isolate and avoid mechanical noises that could reveal locations to underwater passive sonar arrays. Early stealth observation aircraft used slow-turning propellers to avoid being heard by enemy troops below. Stealth aircraft that stay subsonic can avoid being tracked by sonic boom. 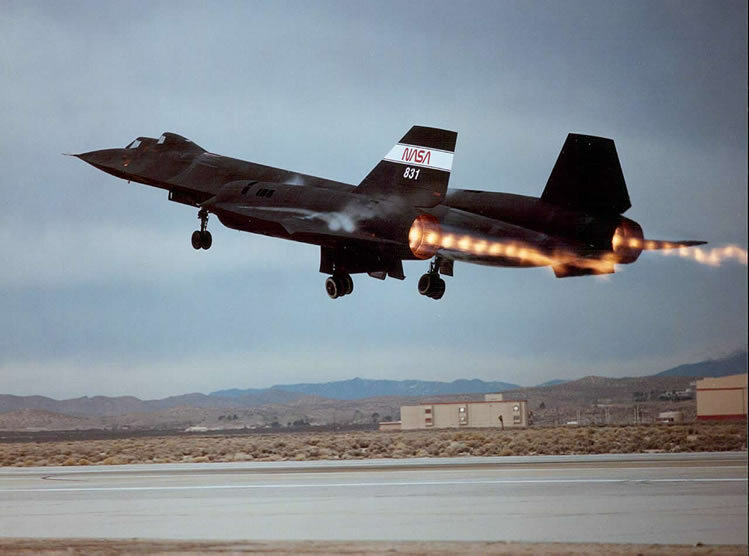 The presence of supersonic and jet-powered stealth aircraft such as the SR-71 Blackbird indicates that acoustic signature is not always a major driver in aircraft design, although the Blackbird relied more on its extremely high speed and altitude. Most stealth aircraft use matte paint and dark colors, and operate only at night. Lately, interest on daylight Stealth (especially by the USAF) has emphasized the use of gray paint in disruptive schemes, and it is assumed that Yehudi lights could be used in the future to mask shadows in the airframe (in daylight, against the clear background of the sky, dark tones are easier to detect than light ones) or as a sort of active camouflage. The B-2 has wing tanks for a contrail-inhibiting chemical, alleged by some to be chlorofluorosulphonic acid, and mission planning also considers altitudes where the probability of their formation is minimized. An exhaust plume contributes a significant infrared (IR) signature. One means of reducing the IR signature is to have a non-circular tail pipe (a slit shape) in order to minimize the exhaust cross-sectional volume and maximize the mixing of the hot exhaust with cool ambient air. Often, cool air is deliberately injected into the exhaust flow to boost this process. Sometimes, the jet exhaust is vented above the wing surface in order to shield it from observers below, as in the B-2 Spirit, and the unstealthy A-10 Thunderbolt II. To achieve infrared stealth, the exhaust gas is cooled to the temperatures where the brightest wavelengths it radiates on are absorbed by atmospheric carbon dioxide and water vapor, dramatically reducing the infrared visibility of the exhaust plume. Another way to reduce the exhaust temperature is to circulate coolant fluids such as fuel inside the exhaust pipe, where the fuel tanks serve as heat sinks cooled by the flow of air along the wings. In addition to reducing infrared and acoustic emissions, a stealth vehicle must avoid radiating any other detectable energy, such as from onboard radars, communications systems, or RF leakage from electronics enclosures. The F-117 uses passive infra-red and "low light level TV" sensor systems to aim its weapons and the F-22 Raptor has an advanced LPI radar which can illuminate enemy aircraft without triggering a radar warning receiver response. The size of a target's image on radar is measured by the radar cross section or RCS, often represented by the symbol σ and expressed in square meters. This does not equal geometric area. A perfectly conducting sphere of projected cross sectional area 1 m2 (ie a diameter of 1.13 m) will have an RCS of 1 m2. Note that for radar wavelengths much less than the diameter of the sphere, RCS is independent of frequency. Conversely, a square flat plate of area 1 m2 will have an RCS of σ = 4π A2 / λ2 (where A=area, λ=wavelength), or 13,982 m2 at 10 GHz if the radar is perpendicular to the flat surface. At off-normal incident angles, energy is reflected away from the receiver, reducing the RCS. Modern stealth aircraft are said to have an RCS comparable with small birds or large insects, though this varies widely depending on aircraft and radar. If the RCS was directly related to the target's cross-sectional area, the only way to reduce it would be to make the physical profile smaller. Rather, by reflecting much of the radiation away or absorbing it altogether, the target achieves a smaller radar cross section. 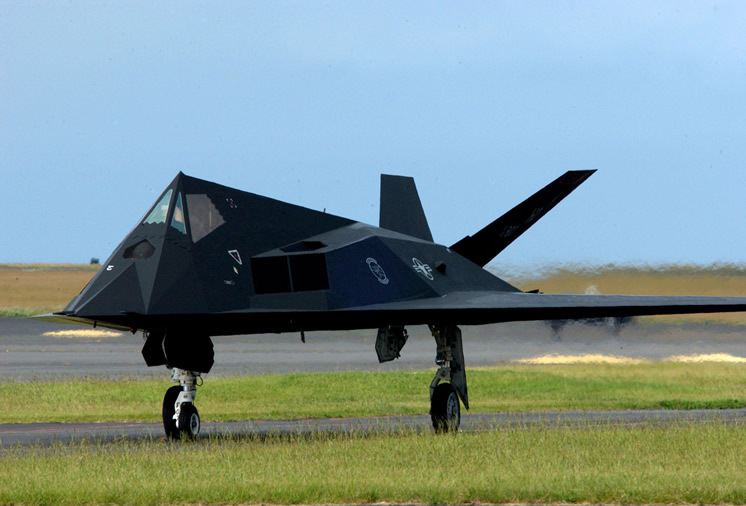 Stealthy strike aircraft such as the F-117, designed by Lockheed Martin's famous Skunk Works, are usually used against heavily defended enemy sites such as Command and Control centers or surface-to-air missile (SAM) batteries. Enemy radar will cover the airspace around these sites with overlapping coverage, making undetected entry by conventional aircraft nearly impossible. Stealthy aircraft can also be detected, but only at short ranges around the radars, so that for a stealthy aircraft there are substantial gaps in the radar coverage. Thus a stealthy aircraft flying an appropriate route can remain undetected by radar. Many ground-based radars exploit Doppler filter to improve sensitivity to objects having a radial velocity component with respect to the radar. Mission planners use their knowledge of the enemy radar locations and the RCS pattern of the aircraft to design a flight path that minimizes radial speed while presenting the lowest-RCS aspects of the aircraft to the threat radar. In order to be able to fly these "safe" routes, it is necessary to understand the enemy's radar coverage (see Electronic Intelligence). Mobile radars such as AWACS can complicate matters.